I’ve been asked this by a friend, and have explained the name to colleagues and clients. “Yes,” I responded, “yes, WTF is intentional and yes, I do know what it means in texting vocabulary.” LOL. The thing is, most of us – even the most optimistic among us – have at least a little bit of “WTF” inside of us, especially at work where our true expressions and feelings are sometimes suppressed because of the corporate culture, a call for professionalism or the need to adhere to a host of other “appropriate” behaviors. I believe that in order to get to the heart of the matter to address our true challenges to transform our workplace experience, we need to be not only irreverent, but take risks and challenge century old norms. Then, a couple months ago in an early-morning spinning class, it hit me: Workplace Transformation Facilitation. 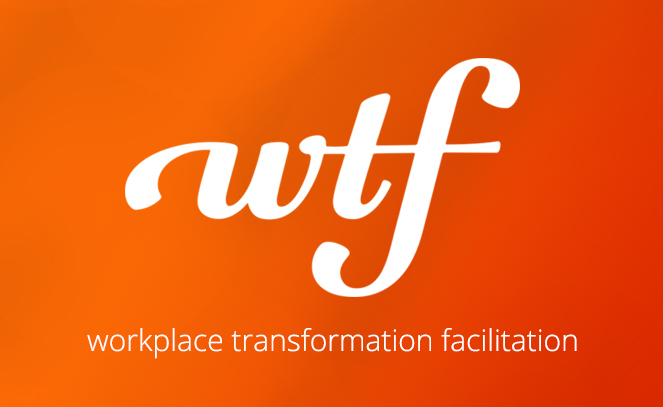 Because, that is what this rebrand is all about: facilitating the entire process of workplace transformation, from space design, to brand, culture and communication. Oh, and honest to God by coincidence, the first letter of each word = WTF. Scouts honor. That is how it came to be WTF. And, yes, I am double-dog sure that is what I want to call it.